Due to its excellent stain resistance and durability, a microfiber couch is the ideal choice for households with children or pets. You can vacuum the couch daily with a brush attachment to keep it fur- and lint-free. Before you perform deeper cleaning, inspect the furniture tag because there are three different types of microfiber. If the tag is labeled with a "W," it's safe to use water-based cleaners on it. If you see the letter "S," use a solvent-based cleaner, such as rubbing alcohol. If the label reads "S-W," you can use both types of cleaners. You can clean all types of microfiber couches -- labeled "S," W" or "S-W" -- with rubbing alcohol. Test it in an inconspicuous spot first, however. To remove any type of stain, such as spaghetti sauce or markers, pour a small amount of isopropyl alcohol on a clean, white cloth and dab it into the fabric to lift the stain out of it. You can repeat this process until the stain is gone, allowing the alcohol to dry in between cleanings. Run over the fabric with a stiff-bristled brush. As another option, work a dab or two of foaming shaving cream, which contains alcohol, into it. Allow the shaving cream to sit on the stain for 10 minutes before patting it dry with a clean cloth. If your couch is labeled "S," an easy way to remove pet and other odors from it is with dry baking soda. Simply sprinkle the baking soda in a thin layer over the smelly areas -- such as the cushions or the arms -- and allow it to rest on the fabric for up to an hour to allow the product to lift the odors. Then, use your vacuum's upholstery attachment and a stiff brush remove the baking soda, as well as any debris such as pet hair and dander, from the fabric. 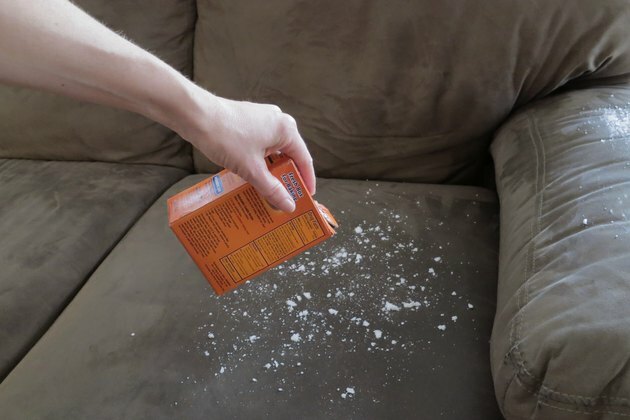 If your couch is labeled either "W" or "S-W," you can make a thick paste of baking soda and water and apply it directly to a food or any other type of odorous stain. Allow the paste to dry, and then vacuum it up. 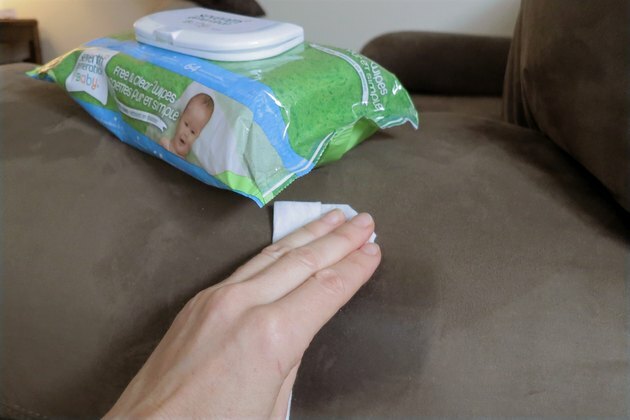 As another method that works for different types of microfiber materials, you can't get more convenient than baby wipes. The wipes are gentle enough to use every day to remove all types of stains, such as water marks and lipstick but have powerful cleaning action as well. Rub the wipe into the stain using a circular motion and allow the spot to air-dry. Repeat the process as many times as you need to until the mark is gone. 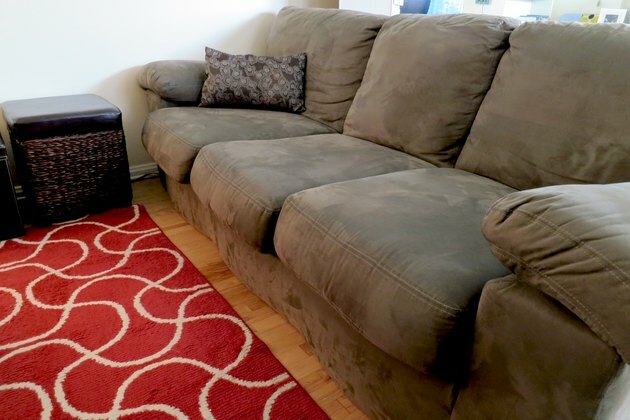 If your couch is labeled "W," you can clean the microfiber fabric using a gentle dish soap and water solution. 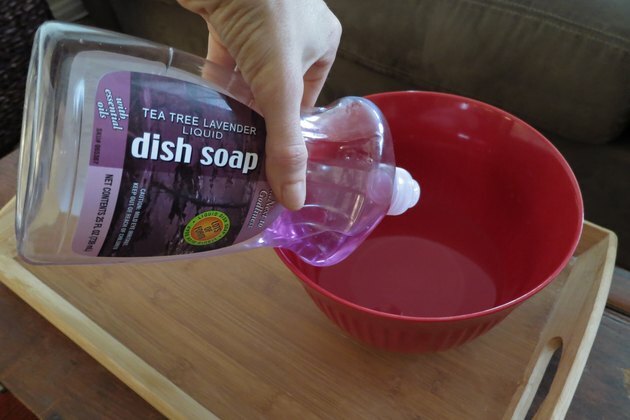 To spot-clean the couch, fill a bowl with warm water and add a few drops of the soap, stirring to combine. Work the solution into the stain using a clean cloth, being careful not to oversaturate the fabric. Allow the spot to air-dry. If your couch has removable cushion covers, you can launder them in your washing machine according to the care label. Hang the cushion covers to dry. Josh Arnold has been a residential and commercial carpenter for 15 years and likes to share his knowledge and experience through writing. He is a certified journeyman carpenter and took college-accredited courses through the Southwest Regional Council of Carpenters training center. As a Los Angeles-based union carpenter, Arnold builds everything from highrises to bridges, parking structures and homes.